Cimarron is Cat Friendly Certified! We are happy to announce our Cat Friendly Certification! We’ve thoughtfully created a safe space for kitties coming to see us where they can wait without dog noses smooshed up on their carriers. We’re all about making a kitty-cat’s trip to the vet as stress-free as possible. We have a cat-champion, Claire, who has taken the steps to help train us all on tips and tricks to making sure each and every cat has the best experience with us as possible. To become Cat Friendly Certified, we have to comply with a rigorous list of physical accommodations, continuing education in feline medicine, psychology and handling of cats and specialized hospitalization nursing care. All of these things mean that your cat’s emotional status is understood and tended while he or she is here- whether for an outpatient visit or hospitalized for illness or surgery. 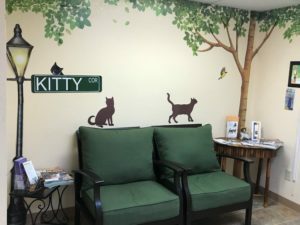 Learn More about what is means to be among the Elite few veterinary clinics that make the effort to be Cat Friendly HERE Come in and check it out! We would love to meet you and your feline friends!